HomeGain reveals new survey findings of top 12 do-it-yourself home improvements for home sellers, based on responses from nearly 1,000 REALTORS®; cleaning and de-cluttering ranks as highest return on investment, followed by home staging. 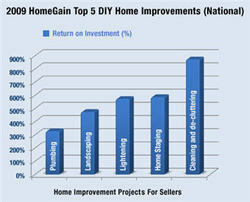 HomeGain's recent survey shows the top do-it-yourself home improvements that Realtors recommend to home sellers. "Inexpensive cosmetic home improvements and basic improvements greatly enhance the value of the home," stated Carol Wilson of Carpenter Real Estate in Indianapolis, IN. 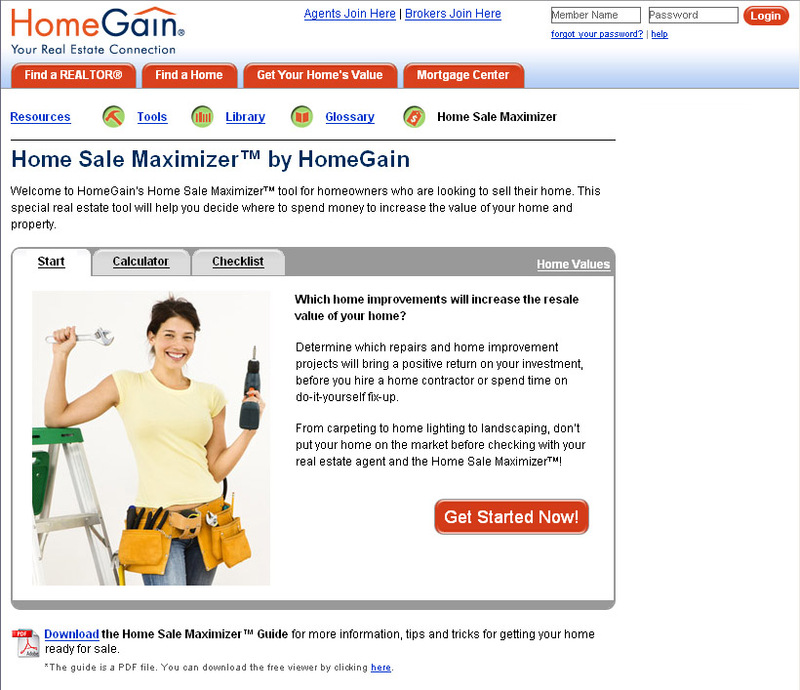 HomeGain.com, the first website to offer web-based free instant home values, today announced that it has released the results of its nationwide home improvement and home staging Home Sale Maximizer™ survey. HomeGain received responses from nearly 1,000 Realtors® nationwide and configured a list of the top 12 do-it-yourself (DIY) home improvements that cost under $5,000 and benefit sellers most when they sell their homes. Cleaning and de-cluttering continues to rank as the top suggested home improvement (since the survey was originally conducted in 2000), recommended by 98 percent of Realtors, costing less than $200 and returning a value of nearly $1,700 to the home's sale price, or an 872% return on investment. "Many Realtors agree, especially in a buyer's market, that sellers who make these recommended home improvements often get their homes sold faster and at higher prices," stated Louis Cammarosano, General Manager at HomeGain. "We have customized our Home Sale Maximizer online home improvement tool to help identify and prioritize the projects that can increase the salability and selling price of a home." Rounding out the top 12, the list of low cost, do-it-yourself home improvements includes: updating electrical, replacing or shampooing carpets, painting interior walls, repairing damaged floors, updating kitchen, painting outside of home, and updating bathroom/s. The home improvement projects with the highest price increases to a home's resale value is Updating the Kitchen ($1,200 cost / $2,850 price increase), followed by Painting the Outside of the Home ($900 cost / $1,815 price increase) and Home Staging ($300 cost / $1,780 price increase). "Inexpensive cosmetic home improvements and basic improvements greatly enhance the value of the home," stated Carol Wilson of Carpenter Real Estate in Indianapolis, IN, HomeGain AgentEvaluator member since 1999. To see the complete survey results, visit the HomeGain Real Estate Blog. Home Sale Maximizer is a home improvement online resource that helps homeowners identify key repairs for getting a home ready for sale, and that can result in a higher sale price for their home. Listen to survey respondents discuss the survey questions during a 30-minute live call on Tuesday, November 10, 2009 by registering on HomeGain Webex.